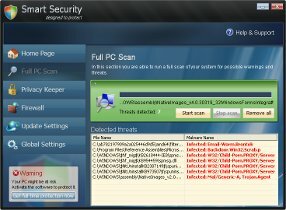 Smart Security is a new fake security program that looks like a real antispyware or antivirus application, but unlike it, can not remove viruses and trojans, as well as protect your computer from possible infections. This parasite is created with one purpose, to force you to buy its full version. Never trust anything relate to Smart Security and uninstall it as soon as possible. The program is promoted and installed with the help of trojans that are mostly distributed via fake online scanners, misleading websites and using social engineering. When the trojan is started, it will download and install the rogue onto your computer. On first run, Smart Security configures itself to start automatically when Windows loads. Next, it will perform a fake system scan and detect a lot of infections that can only be removed with a full version of the program. While Smart Security is running, it will flood your computer with fake security alert and notifications from Windows task bar. However, all the alerts are totally fabricated and must by no means be trusted! You can safety ignore them. Moreover, the rogue will disable Task Manager, block antivirus and antispyware tools from running. As you can see, the program is absolutely useless and what is more, even dangerous software. Most importantly, do not purchase it. Instead, please use the Smart Security removal steps in order to remove this malware from your computer for free.